Step 1. To line pan: Preheat oven to 160C. Grease a 20cm square cake pan, then cut 2 x 20cm x 45cm sheets of baking paper. Use one sheet to line the base and two sides, extending paper beyond rim. Place second sheet in pan in the opposite direction to line base and remaining two sides, also extending beyond rim. Step 2. To chop chocolate: Using a serrated knife, cut chocolate into rough 1.5cm chunks. Step 3. 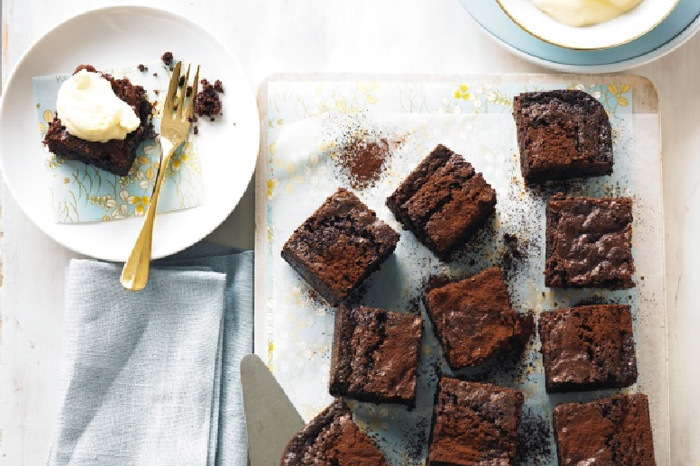 To make brownie: Place butter and a large pinch of salt in a small pan. Melt over low-medium heat until almost melted. Set aside to finish melting and cool slightly. Sift flour, cocoa and baking powder into a large bowl. Stir in sugar. Working 3 batches, add butter and eggs alternatively to dry mixture, stirring well to combine after each addition. Stir in vanilla, then chocolate until combined. Step 4. To cook brownie: Spoon mixture into prepared pan. Using a spatula or the back of a spoon, spread evenly. Bake for 1 hour or until top is risen and a skewer inserted into the centre comes out clean. Cool completely in a pan, then using the paper as an aid, lift the brownie with the paper from pan onto chopping board. Peel away paper, dust with extra cocoa, if desired, then cut into 5cm squares.